Marty Cauley: I Am Giving Away Ebooks THIS WEEK! I Am Giving Away Ebooks THIS WEEK! What am I thinking? A first time author giving away the e-book version of his first book? It sounds ridiculous. Not only am I giving it away, I’m actually encouraging people to wait until it is free to download it AND to share the message that it is free with anyone they think might want a copy. There is a story behind this decision. Last week I was in a gathering with my bishop, Hope Morgan Ward. She has declared the focus for 2015-2016 for the NC Conference United Methodist Churches to be “GIVE.” This is not simply an effort to raise money to keep the institution afloat, but rather a holistic effort for Christians to learn to live generous lives. She is challenging us to live with open hands and open hearts. As I spent the next couple of days reflecting on her message I began to revisit my own life and was amazed at the generosity of others and how God continues to bless me with gifts I can hardly contain. Then I considered, “What do I have that I could give away?” I decided that I could share a little hope into the lives of those who are struggling by giving away my book. The three reasons I am giving it away are that I believe the message is more important than the money, I want to share hope with those who need it most and may not be able to afford it, and I have been blessed so I can be a blessing. The message is more important to me than the money. After careful consideration I have already insisted the book be priced as low as possible. The average paperback inspirational book is between $12.99 and $15.99 for a printed version and $5.99 for an e-book. 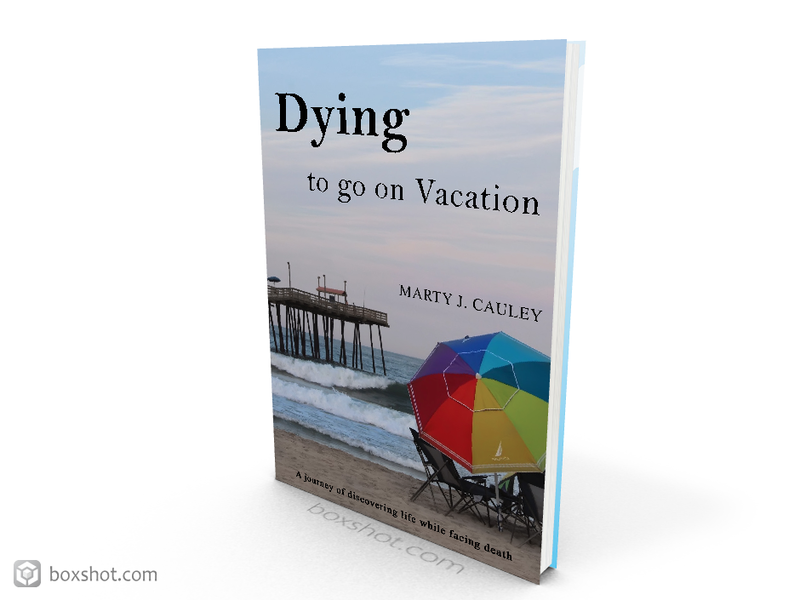 I decided several months ago to price Dying to go on Vacation at only $9.99 for the print version and only $3.99 for the Kindle e-book. My goal was to make the print version less than a large sized drive-thru meal, and the e-book less than the fancy coffee drink you might consume while reading it. I did not write the book to make money. God has provided me with a great job that pays my bills and provides for my family. I wrote the book because when others are struggling with a terminal diagnosis I want them to find hope. Hope that transcends the panic of the moment and inspires them to believe that there are better days coming. Hope that shows them that we should not be scared to death of death, rather endure the “suffering of the present age” because it is “not worthy to be compared” with what God has for us. You cannot put a price on that kind of message! This brings me to the second reason I’m giving the e-book away next week, I want to share hope with as many people as possible, especially those who can least afford it. I have been on the receiving end of some very large medical bills. I have cringed when I opened the envelop from the hospital. Thankfully I have good insurance and a frugal spouse who manages our household budget so carefully that we are able to pay the bills. I am the exception, however, not the rule. In most of the cancer networking groups I participate with online, many of the patients are on the verge of financial collapse. They lose their job because they can no longer do the physical work they had before their diagnosis or because of the side effects of their treatment. When they can’t work, they lose their insurance, and so the spiral of cancer bankruptcy goes. I wrote this book as a an offering of a small bit of light into the darkness that is a cancer diagnosis. I would never want a fellow cancer fighter not to have the book because of the cost. So if you know of a cancer patient who needs this message of hope, let them know they can download it for free next week! I have been blessed to be a blessing. I believe that we are called conduits of God’s blessing, not reservoirs. Our goal should not be to accumulate, rather it should be to let the blessings we receive flow to others. On a whim a couple of weeks I started an Indiegogo Campaign to help defer the costs of editing, publishing, and printing the first 250 copies of Dying to go on Vacation. There are a lot of things about self-publishing that you learn the hard way, one of them is that to produce a quality product it is not cheap. I was faced with a choice, either delay publishing or ask for help, so I asked. My friends and acquaintances overwhelmed me with their generosity. Within 36 hours I had raised by goal amount of $2,500 and over the past couple of weeks, books have continued to sell at a steady pace. That level of commitment from my friends inspired me to share their generosity by giving away the e-book version for five days to make sure they got the digital version to accompany their print version. This also allows me to make sure that anyone with an iPad, Kindle, or smartphone can read it if they want to.